Now, punch is one of those if-by-whiskey topics. If by punch you mean the anything-goes catchall favored at fraternity parties or the cloying mix of canned fruit juice and cheap beverage alcohol customarily ladled forth from cut glass at country club dances, it hardly bears considering. If, on the other hand, by punch you mean the social drink that, in its 18th-century heyday, fueled the European Enlightenment, a subtle and delightful blend of fine and often exotic liquors, softened with water, brightened with the freshly squeezed juices of citrus fruit, sweetened with pure cane sugar, and touched with rare spices—a drink assembled according to exacting formulae and shared by kings and gentlemen, poets and adventurers—well, that's rather a different story, isn't it? It is not, in other words, simply a large cocktail. Like wine, it should be balanced, not too pungent, not too strong, and preferably not decked out in all sorts of gaudy frippery. Throw it all in a bowl and stir to dissolve sugar. Grate nutmeg on top, add one large ice cube. This being my first real foray into punch making, I wanted to hew reasonably closely to something basic and not get too crazy. In fact, I don't think I had ever tried a proper proper punch before I tried the above recipe, and, I have to say, it is quite good. And befitting Mr. Wondrich's wisdom, balanced and very quaffable. As I mentioned in an earlier post, the Pisco Punch (again from Imbibe!) had caught my eye with its combination of Pisco and pineapple with the addition of lemon and sweetener. So I set out to combine ideas from the Pisco Punch and the Good Eats Company Punch and then tinker a bit. I really liked the balance of the Good Eats punch, so I will stick roughly with those ratios. I also want to keep firmly planted in the traditional punches of yore, so I'll also keep the black tea. I'll also use both Pisco and Batavia Arrack, to which I'll add in my new favorite rum, Smith&Cross Traditional Jamaican Rum, in all its pure pot-stilled funk and glory. Punches often contain 2 parts base spirit and 1 part each of two others, but I decided here equal parts work best. (There is the additional plus that it makes the "3 parts strong" from Alton's recipe simple.) Here's the recipe for 8 servings (single serving amounts in parentheses). First remove the lemon peel (no pith please) and add to the spirits so they can extract the flavor. Also add the spent hulls from the limes. For the tea, it should be strong since some plain water comes from the syrup, so brew it twice as long as usual (~6 min). To add additinal spice, add a couple star anise pods and a tsp or so of coriander seeds when brewing tea. As for the Picso Punch, for the syrups soak pineapple chunks overnight in the base syrup (I combined them into one batch). Chill everything then mix in punch bowl, add one large ice cube, and top with grated nutmeg. 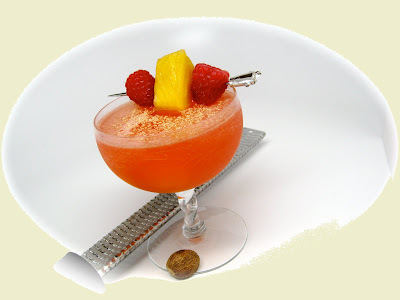 When serving, add syrup soaked pineapple chunk to each glass and top with additional nutmeg. The proportions don't hold exactly to the Good Eats Company Punch ratios, but they are close. for one thing, I used simple syrup instead of sugar crystals, so I cut back on the Tea to account for the water added by the syrup. If you are curious, I experimented and 1 oz water plus 1 oz (by volume) sugar comes to about 1½ oz after mixing, so 12 oz of the syrup would contribute about 8 oz of water and 8 oz of sugar, so that's why that ratio might seem high and the tea seem low. The amount of tea is cut back from its full 4 parts, but not by the full 8 oz from the syrup. I just found this ratio worked better, with only 8 oz the punch was a bit sweet. Perhaps the raspberries I used for the syrup contributed extra sweetness I didn't account for? In any case, I think it meets the criteria set forth by Mr. Wondrich and our host, ie its balanced and quaffable, and, most importantly, tastes good. There are a lot of strong flavors going on, but none dominate. The raspberry syrup even gives it a nice red hue to make it appear more like one might expect a punch to look from previous encounters. Enjoy, and cheers! As for the name, it is semi random but I'll walk you through my circuitous thoughts that led to it. My only previous experience with punch came in college where I lived in Alvar Aalto designed Baker House throughout my MIT career, where Baker House Punch was served at our parties. It is a fine punch, if somewhat less refined than the one I present here, but in any case it was tailored to a somewhat different target audience. More importantly, the secret recipe was passed only from Social Chair to Social Chair, so I am bound by oath not to share the secrets. I still like how the name rolls off the tounge, so I'm calling this new punch the similar sounding Butcher House Punch, as in the butcher, the baker, the candlestick maker...and butchers never get sufficient props in any case. Now that I think about it, probably my first experience tweaking a cocktail recipe was when I had occasion to play with the Baker House Punch to make a variation better suited to match the tropical theme of a beach party we were throwing, complete with a ton of trucked in sand and a waterfall cascading down the stairway into a lagoon we constructed in our basement cafeteria/party space. Good times. UPDATE: Mike has put up the roundup post, check it out.